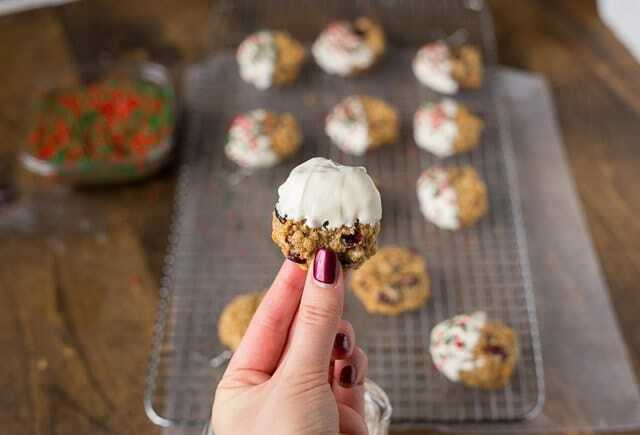 Dipped in white chocolate, spotted with cranberries and topped with sprinkles. 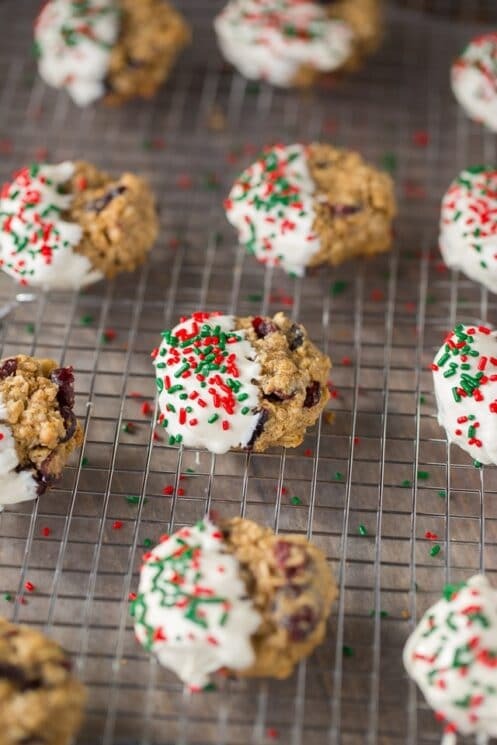 These Oatmeal Christmas Cookies will be Santa’s new favorite midnight snack! Christmas cookies always take over my kitchen counter! I bake them, I get them from the neighbors, I buy them, they’re everywhere! 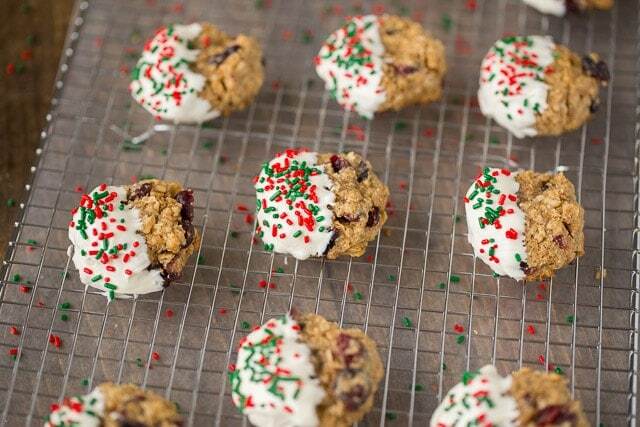 So let’s make a healthier Christmas cookie! 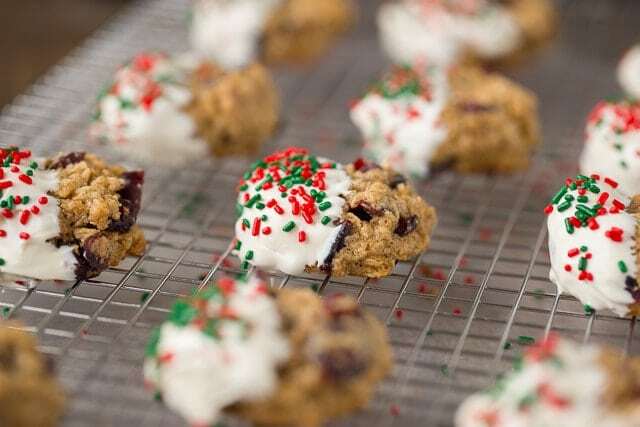 These Oatmeal Christmas Cookies have old fashioned oats, instant oats and oat four packing the fiber and nutrients into a delicious cookie. They bake up like little pillows of goodness and are the perfect sweet bite. Dipping these cookies in white chocolate is totally optional, but is really pretty if you are taking these to a special event. If you don’t want to dip them, you can drizzle the chocolate to use less or you can opt for dark chocolate! I dipped them because the sprinkles just scream Christmas and I love chocolate dipped cookies. We have some incredible recipes for naturally dyed frosting for all your Christmas cookie needs! My one big tip for this recipe is getting the dough balls right! The cookies don’t rise or spread very much when they bake. So press down to flatten out your dough balls before they bake (my photo was taken before I did that). 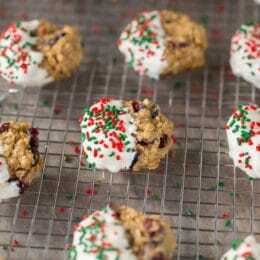 The first time I baked these I got oatmeal balls cookies! They were delicious but I wanted a flatter cookie! And since this dough doesn’t spread much, the size of your dough balls will be about the size of your cookies. I made bite sized cookies and it was perfect for my neighborhood party. I don’t own a double boiler so I always just use Pyrex measuring cups that are microwave safe to melt my chocolate in the microwave. They’re perfect for dipping too! White chocolate magic. It goes so well with the cranberries and oatmeal! My local grocery store (Macy’s) mixed up this sprinkles combo for me! The bakery department has all types of colors of jimmies they use for their doughnuts so they just mixed up a batch of Christmas ones for little ole me! I’m so excited to get my own mixes for all the holidays! 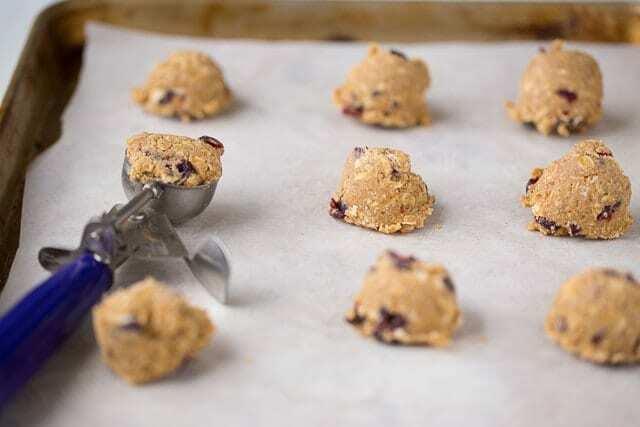 Take 3/4 cup of old fashioned oats and turn it into oat flour by zipping it in a blender or food processor. Add to bowl with oats, quick oats, cinnamon, salt, vanilla, egg (at room temperature), brown sugar and melted coconut oil. Stir until combined. Add cranberries and stir again. Let chill in the fridge for 30 minutes. This solidifies the coconut oil and makes the dough thick enough to scoop. Preheat the oven to 375 degrees and make small dough balls and place on cookie sheets. Slightly flatten your dough balls so they don’t bake too tall! Bake for 7-9 minutes. Using a double boiler or the microwave, combine white chocolate chips and coconut oil. 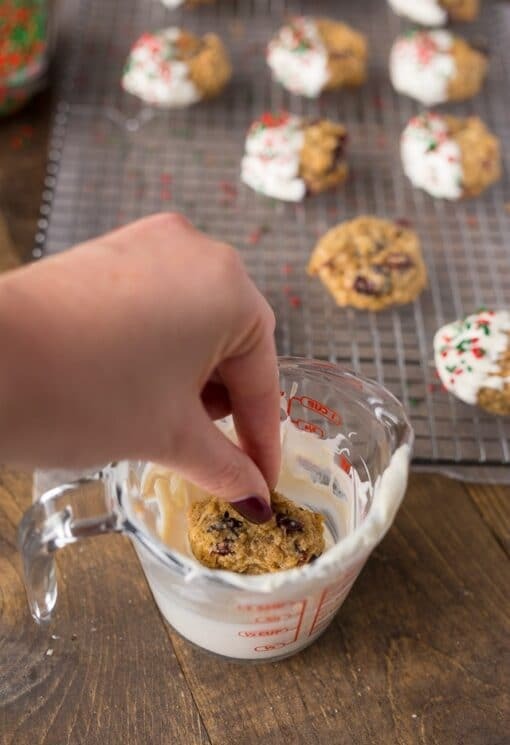 Stir until smooth and then dip cookies and add sprinkles! When you say 3/4 cup of oats to make flour, is that added on to the ingredients or taking it from the ingredients?